The International Accounting Standards Board (IASB) is organised under an independent foundation named the IFRS Foundation. The Foundation is a not-for-profit corporation which was created under the laws of the State of Delaware, United States of America, on 8 March 2001. 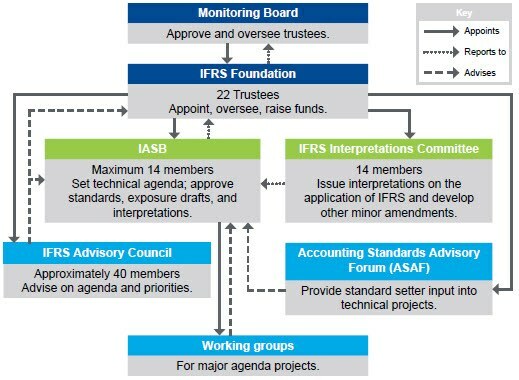 The components of the overall structure of the IFRS Foundation are set out below. The obligations and high-level operating procedures for most components are established under the IFRS Foundation Constitution. The IASB replaced the IASC Board of the International Accounting Standards Committee (IASC) with effect from this date. The IASC was formed in 1973. Until 31 March 2010, the IFRS Interpretations Committee was named the International Financial Reporting Interpretations Committee (IFRIC). IFRIC replaced the Standards Interpretations Committee (SIC) of the IASC with effect from 1 April 2001. The SIC was part of the original IASC structure formed in 1973. Until 31 March 2010, the IFRS Advisory Council was named the Standards Advisory Council (SAC). Formerly the Analyst Representative Group (ARG).